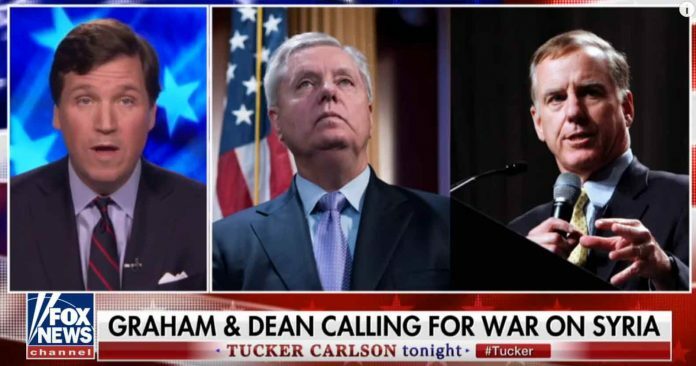 Shattering the left right paradigm, and likely shocking many of the network's regular viewers, FOX News host Tucker Carlson blasted both parties and exposed their bipartisan push for illegal war in Syria. (RT) — As US leaders and mainstream media push for the nation to go to war in Syria, Fox News host Tucker Carlson has slammed so-called “geniuses” who claim to know the truth behind the alleged chemical attack. Speaking on his television show on Monday, Carlson spoke of the alleged attack in the Damascus suburb of Douma. However, he noted that while “genius” politicians, media, intelligence services, and think tanks seem to blame Syrian President Bashar Assad for the attack, they don’t actually know what happened on the ground. “Tucker Carlson is without question the greatest American in the mainstream media,” tweeted the executive director of the Ron Paul Institute for Peace and Prosperity, Daniel McAdams. He added that Carlson may have saved “thousands of lives, maybe more” through his comments.